Sadly nothing to do with East End hard man and actor, Ray Winstone, this 5-reel slot from leading developers Gamesys has everything to do with hard men from a totally different era: the prehistoric one! The heavies in this case are cavemen, or TV cavemen, that should be, as the Winstones is a parody of the classic 1960s Hanna-Barbera cartoon, the Flintstones. There's even a comedy woolly mammoth 'pet' to accompany the family on the reels. Elsewhere on the reels in this 25-payline slot is a dinosaur baby, the Mum (in funky '60s haircut) and a hippy-looking Dad. The card symbols 9-to-Ace have been given a suitably 1960s makeover too, and the theme music will have you humming The Flintstones theme tune over and over. 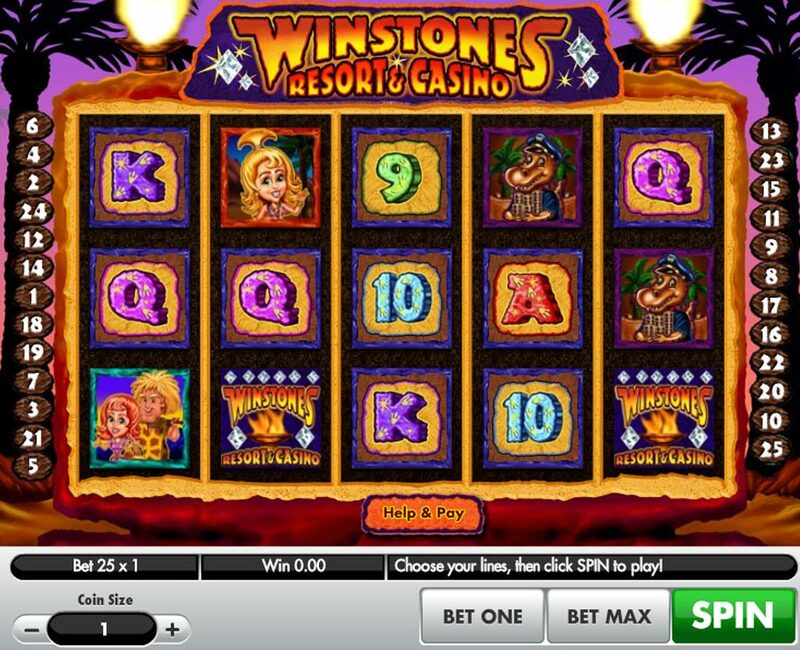 The Winstones logo is Wild, and substitutes for all regular symbols in the game other than the Scatters. A 2x multiplier is attached to all wins as well. From The Flintstones to hit animated film Ice Age, a dozy woolly mammoth plays center stage, and so it is here. Three or more of the big hairy lump anywhere will activate the Pterodactyl Wheel Bonus. Essentially, a spin of the prize wheel determines free spins and your multiplier. 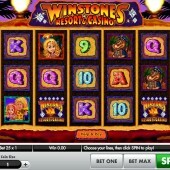 Hit the wheel right and you can bag up to 20 spins with a nice 5x multiplier attached. I actually played The Winstones on a mobile phone first, and it's nice to see where the game came from originally. It's fast and fun, with some typically slick Gamesys graphics and gameplay on show. Gamesys are good when it comes to comedy on five reels, so make sure you track down the (admittedly very different) online slot based in the art world - Frederic vs. Francois: In It For the Monet. Elsewhere at your friendly local online casino have a look for the simple-yet-effective Egyptian-themed slot, Valley of the Kings - it's worth the effort.